As I drag the smart ‘EQ band’ around, the jagged line shows the actual correction being applied: note that a smart ‘boost’ in this case is actually applying a cut in the mid range. On most sources, the smart curve is much more subtle than in this screenshot. 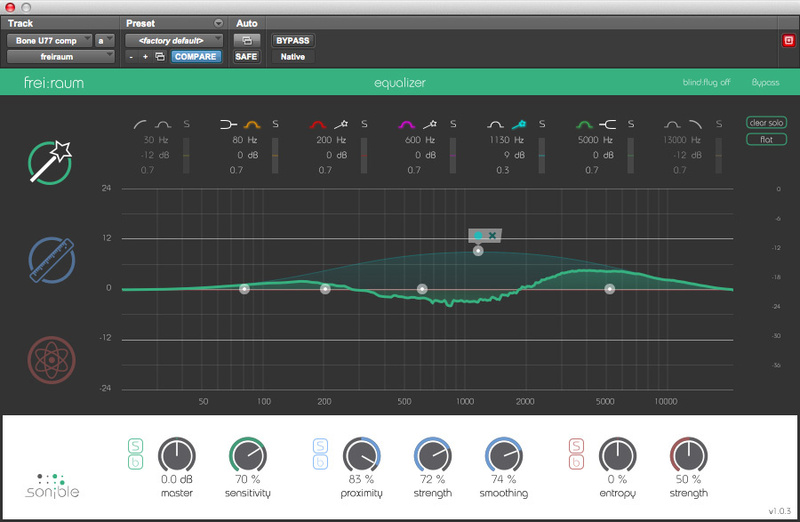 According to Google, the name of Sonible’s intriguing EQ plug-in translates to English as ‘free space’. I’ve called it an EQ plug-in because Sonible do, and it’s true that Frei:raum can behave as a conventional parametric equaliser. However, its EQ-like interface exists mainly to provide familiar and frequency-sensitive access to other features, including reverb removal and the ability to rebalance the pitched and noise components of a source. It’s available in AAX and VST formats on both Mac OS and Windows, and also as a Mac Audio Units plug-in. All the action takes place within one neatly designed, clean-looking interface, which can be switched between three different modes and changes colour accordingly. Through the green window we find what seems on first inspection to be a standard-issue plug-in EQ, with five parametric bands sandwiched by high and low shelves. And so it proves, until you click the little magic wand icon that forms part of each band’s control group. This turns the band into a ‘smart filter’; play back a representative section of the audio source and Alt-click this icon, and Frei:raum will begin to ‘learn’ its frequency characteristics. The analysis takes a few seconds, and once it’s complete, your EQ band is no longer a blunt instrument but one tailored to the frequency content of your source. A ‘smart’ EQ band can be configured just like a dumb one — you click and drag a little circle up or down to control gain, and sideways to set its centre frequency, or up and down with the Alt key held to change the bandwidth — but its effect on your music is very different. For one thing, it’s much more subtle. If you drag a smart band to the position that represents a 10dB boost for the standard EQ, chances are it won’t boost any one frequency by more than a dB or two, and at any given frequency, doing so might well actually impose a small cut instead. The documentation doesn’t explain the process in detail, but it seems that when Frei:raum ‘learns’ something, what it’s actually doing is inspecting the audio for peaks in the frequency spectrum, before somehow deciding which of these are actually musical, and which are unwanted resonances. Applying ‘boost’ in a smart EQ band strengthens the musical frequencies and attenuates the undesirable resonances, while ‘cutting’ does the opposite. The action is also frequency-sensitive, with the most ‘correction’ being applied at the centre of the band, and none at all outside its extremes. As you move the band around, a very wiggly line appears to indicate the actual transfer function that’s being applied. Sonible’s Alexander Wankhammer told me that “based on the design of the algorithm, it tends to work best on quite ‘dense’ sounds, where each spectral region has some kind of ‘useful’ signal component”, and my experience bore out this statement. I tried the smart EQ on a variety of individual tracks and buses, and across the master bus. Initially, at least, I found that whatever it did was quite seductive, but I couldn’t put my finger on why, or how exactly it was changing the sound. When I came back to my projects after the dust had settled, however, I wasn’t always so enamoured of it. Switching the bypass button in and out definitely changed the sound in a subtle way, but it was often very hard to decide whether the processed sound represented an improvement, or merely a difference; and quite often, the results of ‘cutting’ were just as sonically pleasing (or not) as those of ‘boosting’. As a result, only a few instances of Frei:raum as a ‘smart EQ’ made it into my final mixes. However, that’s not to say that it’s not a valuable addition to your plug-in folder. Where a source does have a clear tonal imbalance to start with, Frei:raum will usually pick up on this; and even when I ended up not using it, the settings it came up with often suggested useful ways in which conventional EQ could be applied to the same track. That being the case, it would be nice if it were possible to scale the action of the ‘dumb’ EQ bands to roughly match the amount of processing they apply in ‘smart’ mode; as it is, switching a band from ‘smart’ to ‘dumb’ usually produces a jarring tonal change, as the ‘dumb’ version is much more drastic for any given setting. Here, I’m applying a big global reduction in the amount of room reverb on my source, but this is shaped to be more prominent in the upper mids.Smart EQ is, in any case, but one of the arrows in Frei:raum’s bulging quiver. Click on the ruler icon, and the interface turns blue, indicating that you are now in ‘proximity EQ’ mode. The implication here is that Frei:raum can somehow retrospectively reduce the distance between microphone and source, but it would perhaps be more apt to describe what it does as changing the balance between direct and ambient or reverberant sound. Again, this can be restricted to specific frequency regions using EQ-like ‘bands’, but there is also a gobal Proximity control that affects the overall wet/dry balance, plus Strength and Smoothing parameters. The third string to Frei:raum’s bow, denoted by a magenta hue, is described as ‘entropy EQ’. The sound produced by most musical instruments can be thought of as having two components: a pitched element consisting of a series of sine waves in a stable harmonic relationship, and an unpitched or inharmonic noise element which is unrelated to the pitch of the note. Examples of the latter might include the ‘chiff’ of a flute, pick noise on an acoustic guitar or mechanical noise in a piano. The idea behind ‘entropy EQ’ is that Frei:raum can separate out these two components and allow you to rebalance them, again either on a global or a frequency-specific basis. Neither of these operations is completely unprecedented. For example, Zynaptiq’s Unveil is a very sophisticated plug-in dedicated solely to reverb removal, while Frei:raum’s entropy EQ inhabits territory that’s already occupied by applications such as Melodyne. However, they are hardly standard tools yet, and Sonible’s implementation of both in an EQ-like, frequency-dependent interface is definitely a fresh idea. 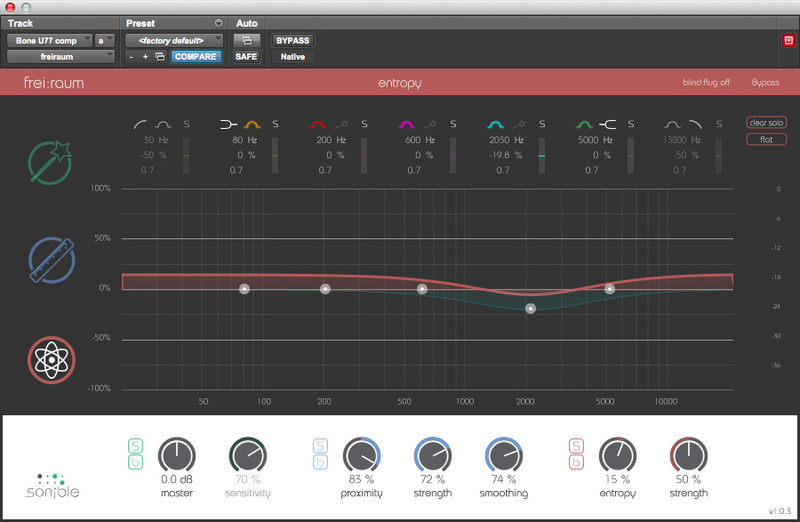 ‘Entropy EQ’ can rebalance the pitched and unpitched components of a source sound. In practice, both are easy to use, and as ever with this sort of sophisticated DSP, results vary considerably from source to source. I found it hard to achieve any useful reverb reduction before unnatural artifacts became apparent on drum overheads; yet proximity EQ did a remarkable job of salvaging a trombone that I’d been forced to record in a small room. The ability to target both processes to specific frequency regions has clear advantages, too. Bad room sound is often bad precisely because it contains honks and resonances at particular frequencies, while issues such as excessive sibilance or pick noise tend to manifest themselves mainly in the high frequencies rather than across the board. In the course of my testing, I didn’t run into any real-world applications for entropy EQ that would be beyond the scope of other processors such as multiband dynamics or transient-shaping plug-ins, but I’m prepared to believe that they exist! Cutting-edge technologies tend to be pricey to start with, and Frei:raum was no exception. As we went to press, however, the price was about to fall to a more reasonable $299 — and for that, of course, you get not one but three innovative DSP processors. Their combined implementation within a single EQ-like interfaces makes good sense, and all of them are straightforward to use, though unsurprisingly, the plug-in imposes a fairly hefty CPU load, so wouldn’t be usable across every channel in a busy mix. I confess to being uneasy at the way in which ‘smart EQ’ is presented as waving a magical DSP wand that simply makes things sound better, but if you’re less of a control freak than me, you’ll probably find that it often does have that effect! For me, the most obvious customer for this plug-in is the harrassed and time-poor engineer working in audio post-production, for whom its combination of easy-to-use reverb reduction and magic-wand waving could be just the ticket. And though it probably can’t be considered a must-have for music production and mastering, there are plenty of potential applications here too, and it’s definitely worth downloading the time-limited demo and exploring what it can do for you. Three innovative audio processing algorithms in a single plug-in. The EQ-like interface makes it easy to focus Frei:raum’s action on trouble spots in the frequency spectrum. 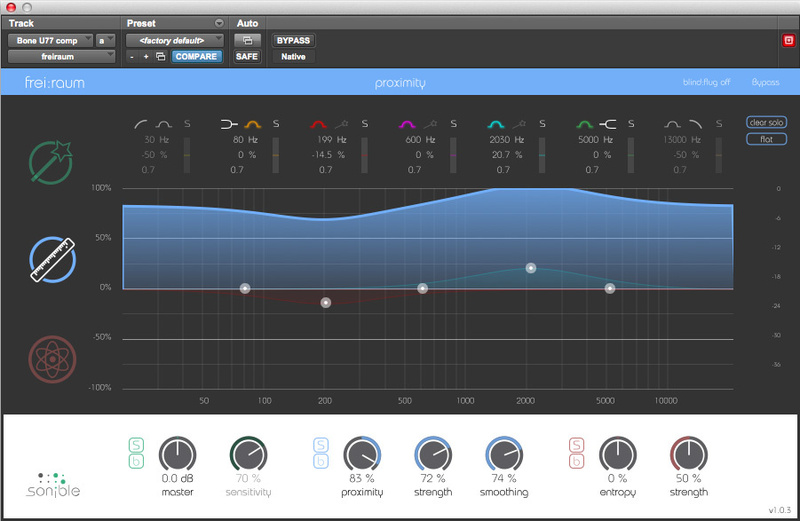 Frei:raum’s ‘Smart EQ’ is often very subtle, especially compared with the conventional equaliser. 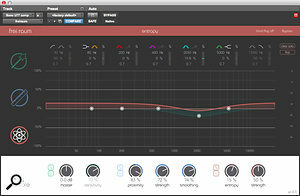 Frei:raum packages some very sophisticated DSP in a friendly and familiar interface. Not everyone will need what it does often enough to justify the asking price, but if you frequently have to rescue bad recordings, it could prove very handy.